I’m not naive … I know our history regarding the native peoples of this land. But I found it interesting that in the very document with which we declare our independence from one tyrant, we dismiss as merciless savages the people whose independence we were in the process of destroying, a process that continued for hundreds of years. On this Independence Day, there are lessons to be learned from the Declaration. There’s that beautiful statement about inalienable rights and there’s the specifics of why we declared our independence. I think we can take pride in our founding fathers that they took the time to eloquently state why they were undertaking what, to the British, was treason. For the most part, the Declaration of Independence is a beacon in a world where there is too little freedom. Then there’s that bit about merciless savages. Too often in political debate these days, The Intent of Our Founding Fathers is cited as a reason for continuing with certain governmental policies. The gun controversy swirling around the second amendment is good example. But when we read about the merciless savages in our most cherished document, we see that even these brilliant statesmen were human, not gods, subject to their own prejudices and those of the times. That should give us pause before continuing a policy solely because our Founding Fathers did so. It also highlights a fault we have as a species … that even in our best moments, we are capable of dismissing the opinions and the very independence of others by giving them a name not quite entitled to be enfranchised by our lofty initiatives. 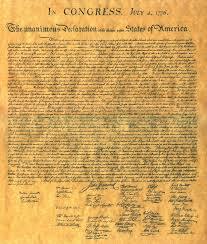 Merciless Indian savages … whops … kikes … niggers … japs … crackers … trailer trash … pollacks … faggots … the list goes on and on, and at some time, each of those groups has been excluded from the unalienable rights that the Declaration promises. By seeing conservatives as uncompassionate, greedy gun-toters, liberals don’t have to consider their opinions and by equating liberals with communists, conservatives can claim they are out to ruin the country. It’s sad. I used to call myself a conservative but I really don’t like either persuasion much. Self-righteousness isn’t pretty on either side of the aisle. A good way for each of us to celebrate Independence Day would be to revisit those unalienable rights … then stop dismissing those different from us … or with whom we disagree … as merciless savages. We can actually listen and think. We can, if we want, be better than our Founding Fathers. It just takes effort. Happy birthday, America. God bless. This entry was posted on July 4, 2018 at 11:53 am and is filed under feeling older. You can subscribe via RSS 2.0 feed to this post's comments.